Earthquakes. It's a term that most in the Appalachian Mountain region mainly associated with the west coast….that is until the emergence of social media. 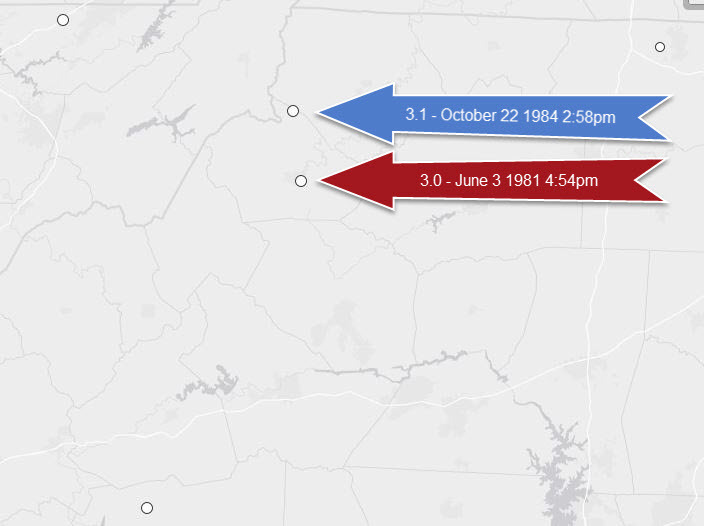 As with the history of tornadoes in the High Country earthquakes are more numerous than you may have thought, especially in the last several years. 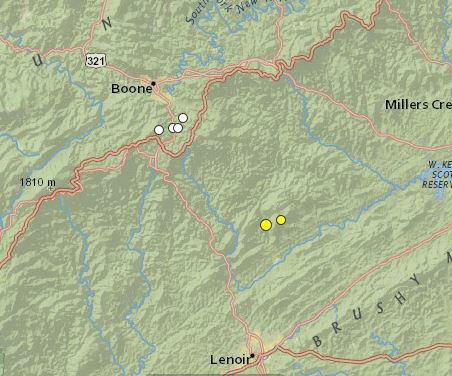 Since 1980 there have been 28 earthquakes of at least a 1.0 magnitude within a 62 mile radius (100 kilometers) of Boone, according to data from the United States Geological Society (USGS). 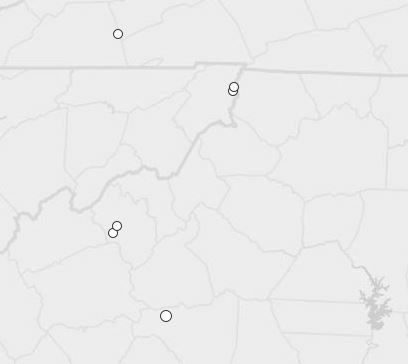 There have been 10 recorded quakes felt in the High Country since 2011 and 6 of those occurring in 2014 alone. Here is a list of earthquakes since 2011. More in depth information, graphics and the history since 1970 can be found by clicking on the date link, or by scrolling further down the page. 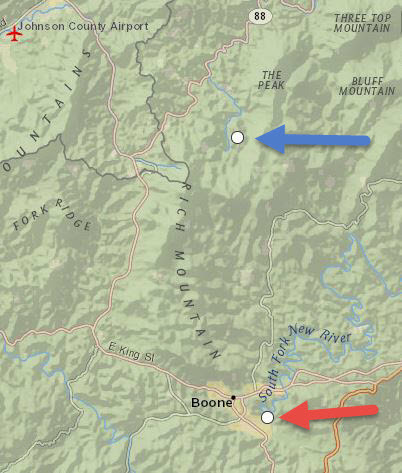 Saturday November 10, 2018 10:33 pm – 2.0 magnitude, centered0.2 miles east of Whaley and 14.2 miles west of Boone. 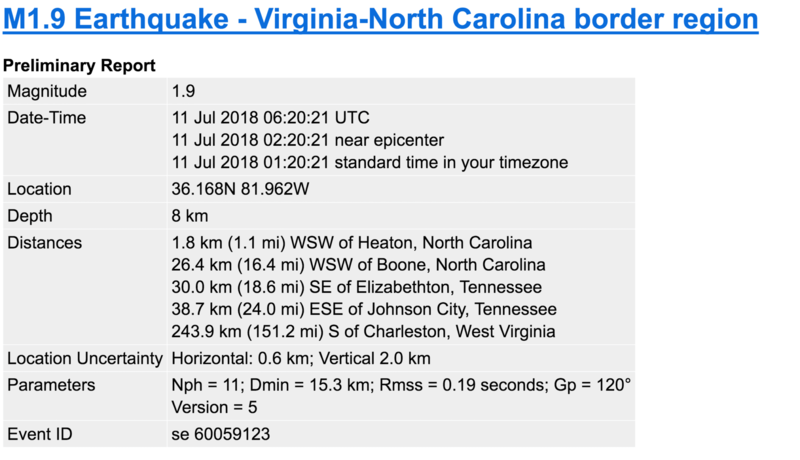 Wednesday July 11, 2018 1:20am – 1.9 magnitude, centered 1.1 miles west-northwest of Heaton and 16.4 miles west-southwest of Boone. 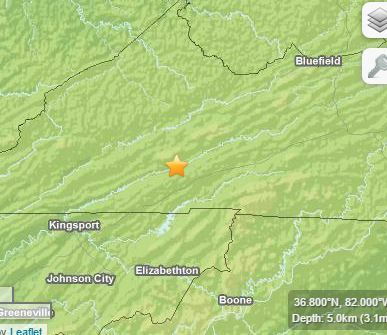 Monday July 9, 2018 3:03 am – 2.0 magnitude, centered 1.4 miles west-northwest of Heaton, 16.5 miles west of Boone, 18 miles southeast of Elizabethton, Tennessee. 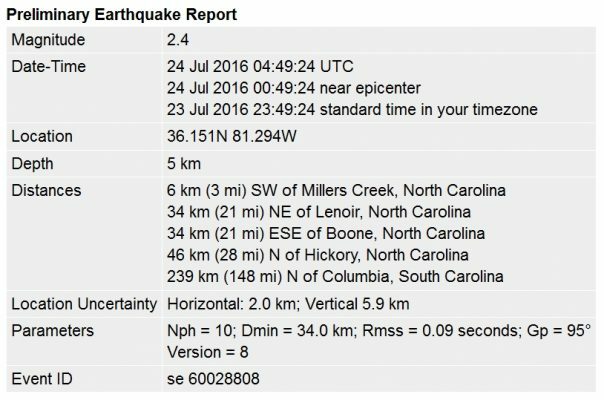 Saturday July 23, 2016 11:49pm – 2.4 magnitude, centered 3 miles southwest of Millers Creek, 21 miles east southeast of Boone. Thursday July 21, 2016 5:01pm – 1.9 magnitude, centered 5 miles southwest of Newland, 21 miles southwest of Boone and 24 miles south southeast of Elizabethon, Tennessee. 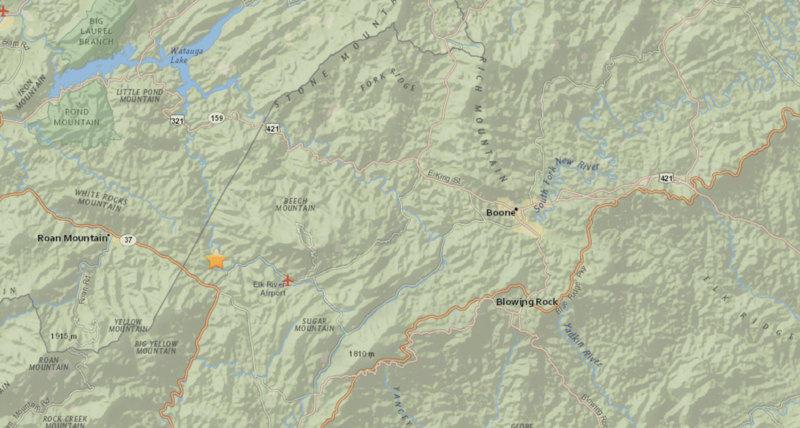 Monday December 15, 2014 1:44am – 3.0 magnitude, centered 9 miles north of Lenoir, 14 miles southeast of Boone, 22 miles north northeast of Morganton. 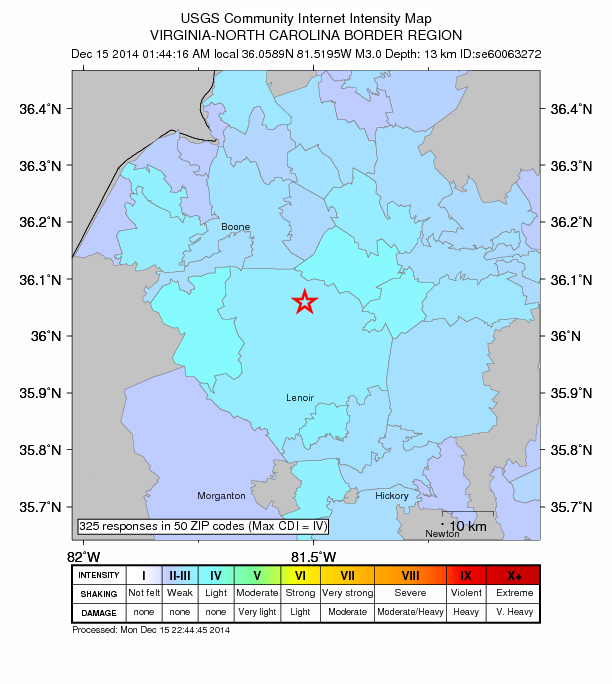 Sunday December 14, 2014 9:27pm – 2.1 magnitude, centered 10 miles NNE of Lenoir, 14 miles SE of Boone, 23 miles NNW of Hickory and 24 miles NNE of Morganton. 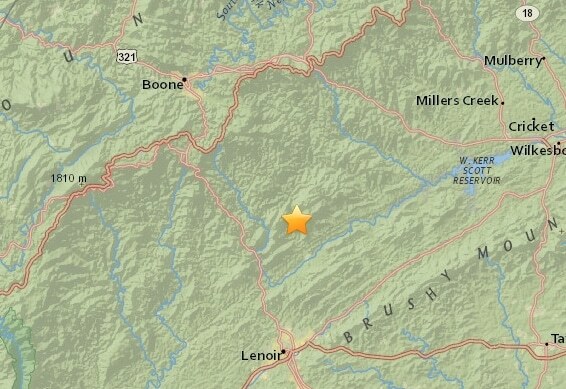 Thursday June 12, 2014 1:28pm – 2.5 magnitude, centered 2 miles east of Blowing Rock, 6 miles SSE of Boone, 16 miles NNW of Lenoir. 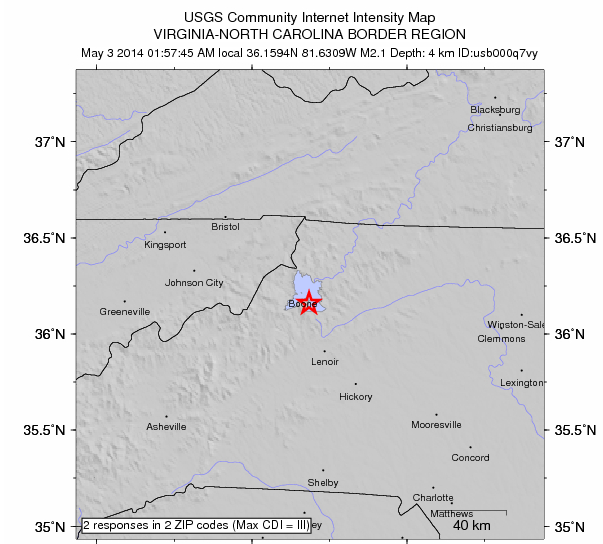 Saturday May 3, 2014 1:57am – 2.3 magnitude, centered 3 miles SSE of Boone, 19 miles NNW of Lenoir, 30 miles north of Morganton. 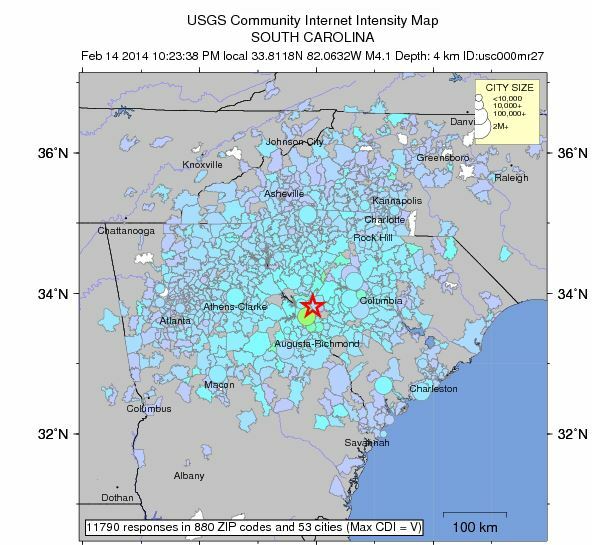 Friday February 14, 2014 10:23pm – 4.1 magnitude, centered 9 miles WNW of Edgefield, South Carolina, 62 miles WSW of Columbia, South Carolina. 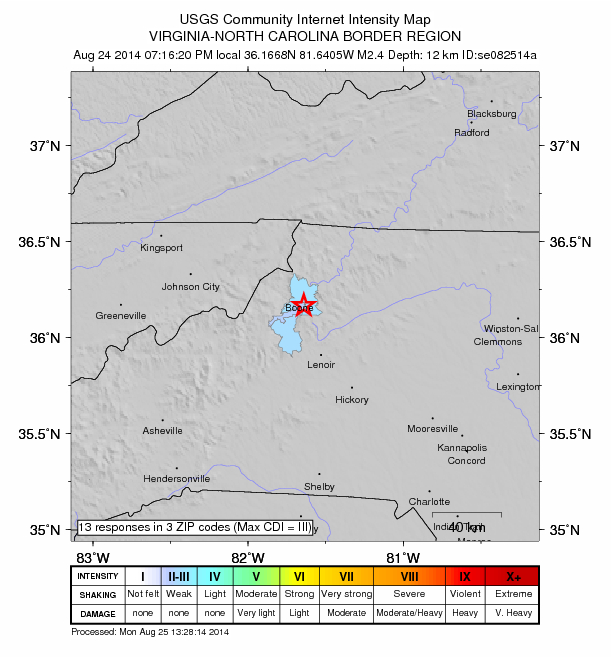 Sunday August 25, 2013 3:50pm – 2.9 magnitude, centered 2 miles NNE of Blowing Rock, 3 miles S of Boone 19 miles NNW of Lenoir, 29 miles N of Morganton. 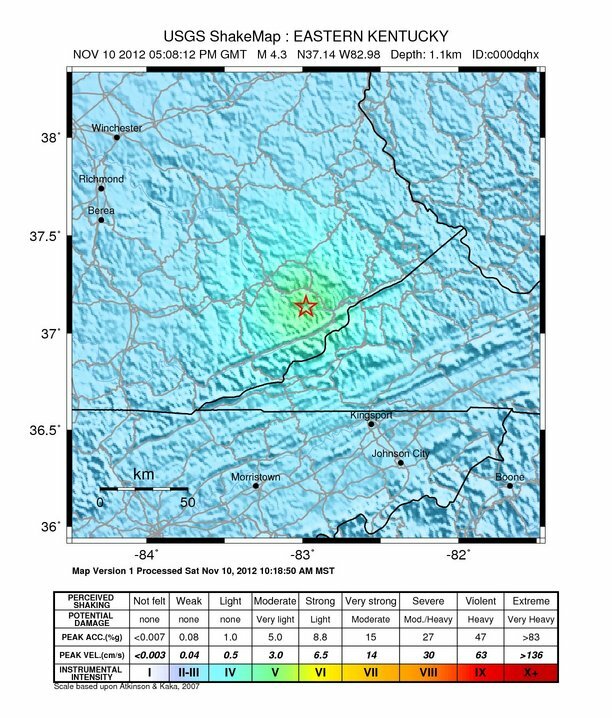 Saturday November 10, 2012 12:08pm – 4.2 magnitude, centered near Whitesburg Kentucky. 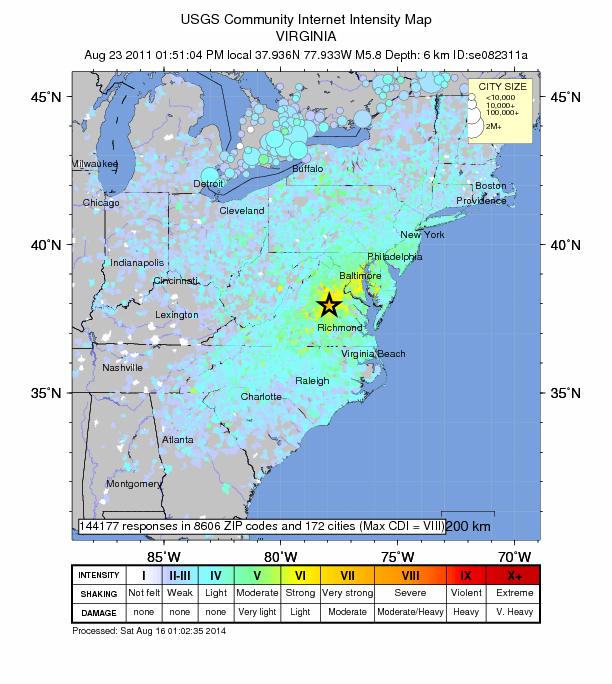 Tuesday August 23, 2011 1:51pm – 5.8 magnitude, centered 38 miles northwest of Richmond, Va., about 84 miles southwest of Washington, D.C.
Maps of recorded earthquakes between January 1, 2011 – December 16, 2014 . 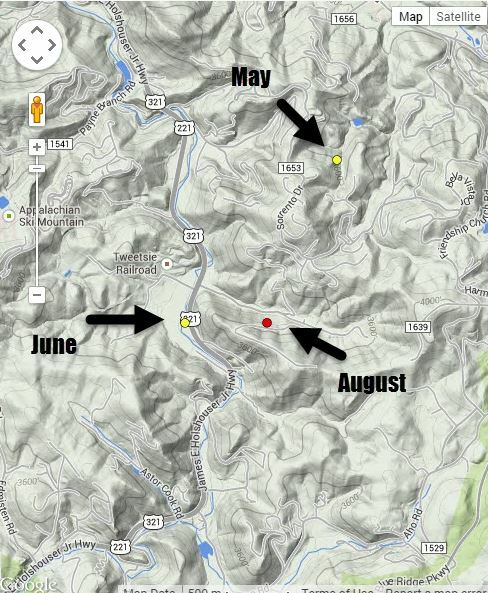 The yellow dots represent the quakes on Dec 14 & 15 2014. 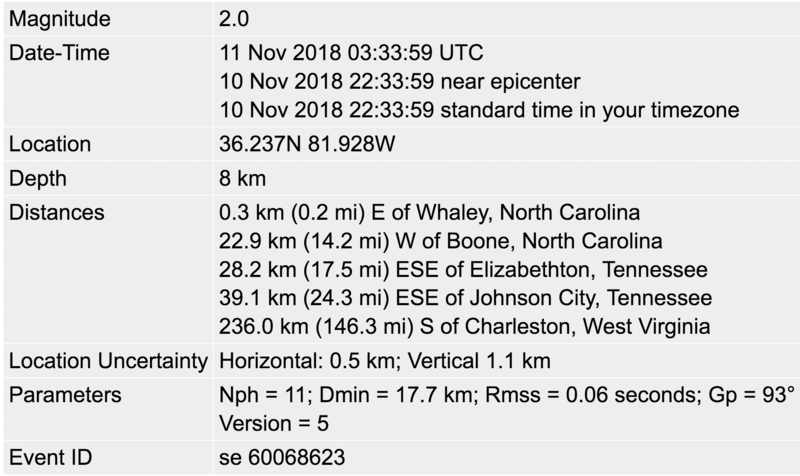 Saturday, November 10, 2018, 10:33 pm – 2.0 magnitude, centered 0.2 miles east of Whaley and 14.2 miles west of Boone. 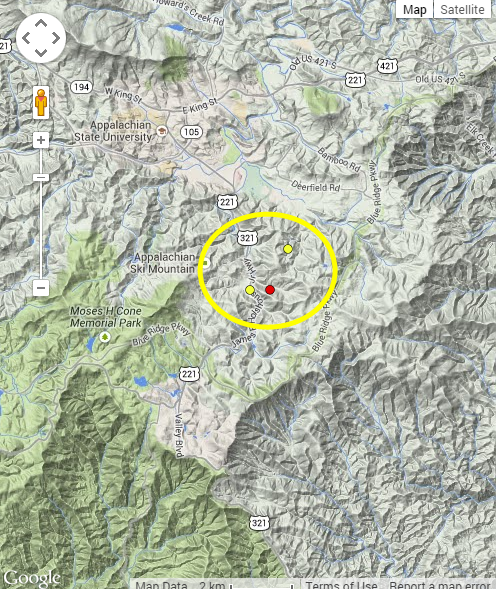 Sunday August 24, 2014 7:16pm – 2.4 magnitude, centered 2 miles NE of Blowing Rock, 4 miles SSE of Boone, 18 miles NNW of Lenoir, 29 miles N of Morganton. 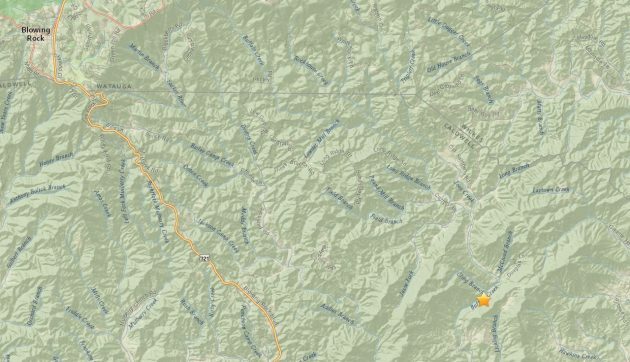 At the time Brad Panovich of NBC Charlotte noted that this was the 3rd earthquake near Tweetsie Railroad since May. 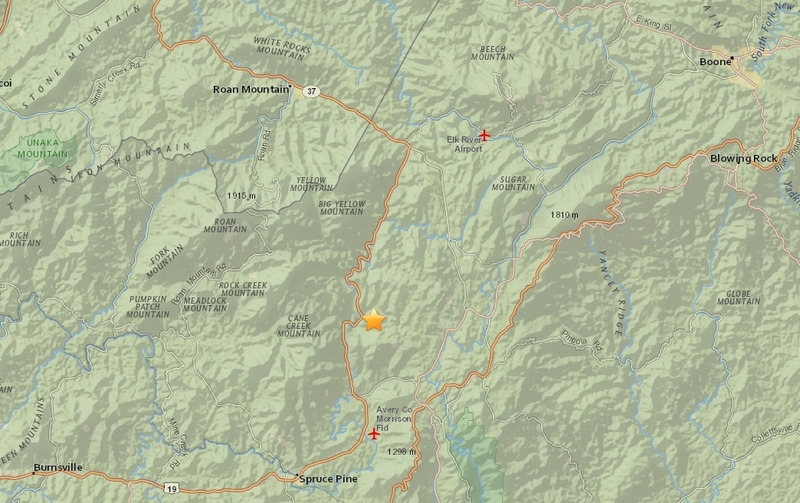 It was not until the next morning that USGS officially confirmed the quake. 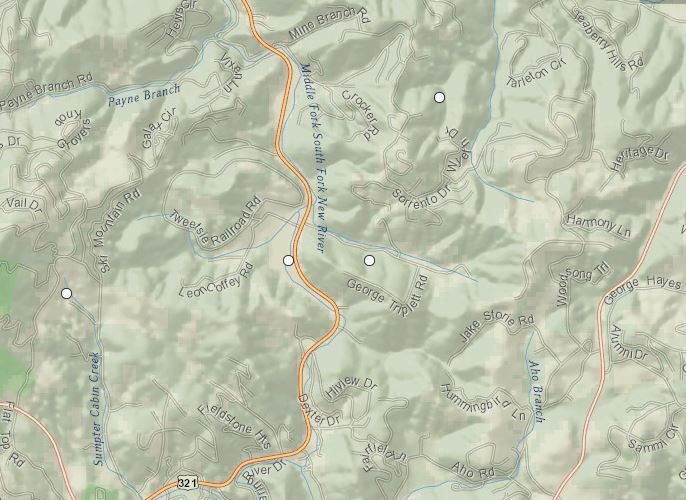 Reports into the Watauga Roads social media outlets began just seconds after the event, but there were no reports of damage. 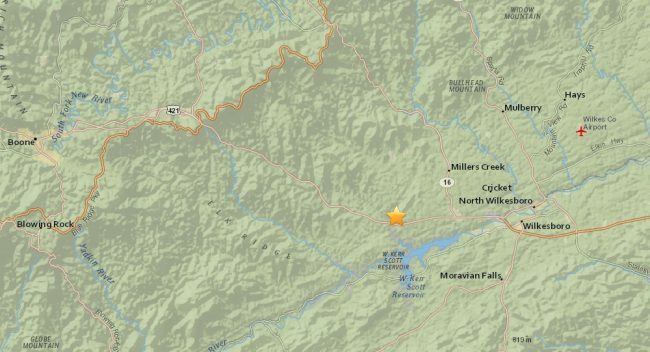 At the time comments into the Watauga Roads facebook page first came in just after 2am reporting the shaking and rumbling sound. No damage was reported. 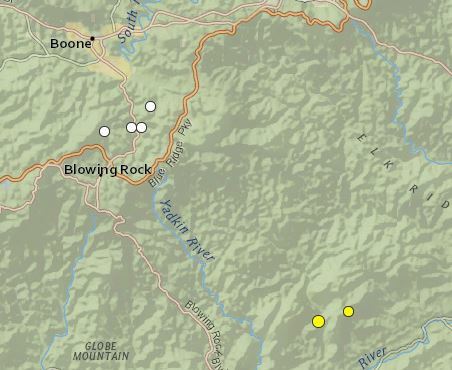 At the time reports from Blowing Rock, Boone, Vilas, and Fleetwood came into the WataugaRoads.com social media outlets about the feeling the quake locally. 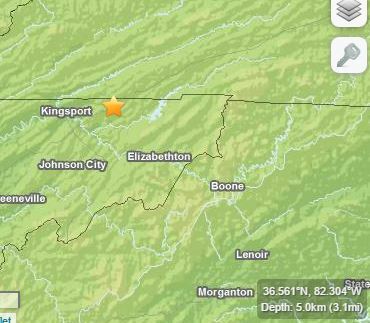 Saturday November 10, 2012 12:08pm – 4.2 magnitude, centered 8miles W of Whitesburg, Kentucky; 46 miles NNW of Kingsport, Tennessee; 55 miles NE of Middlesboro, Kentucky; 57 miles NW of Bristol, Tennessee; 111 miles SW of Charleston, West Virginia. 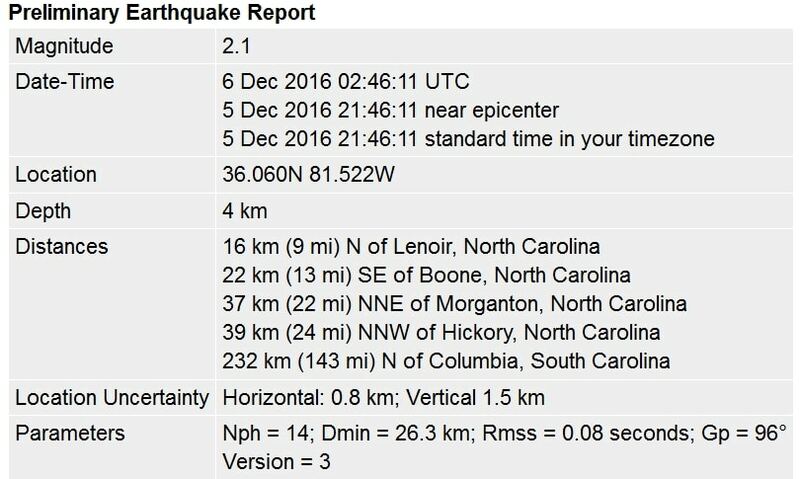 At the time many residents in the immediate area reported feeling a possible earthquake lasting 3 to 4 seconds. 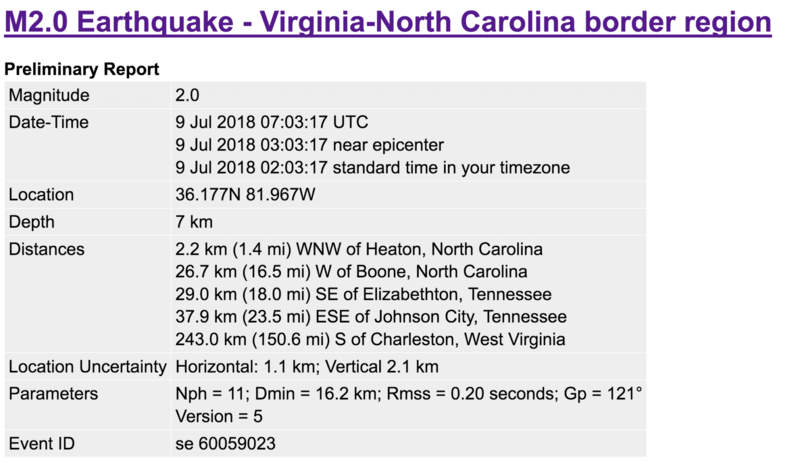 Tuesday August 23, 2011 1:51pm – 5.8 magnitude, centered 38 miles northwest of Richmond, Virginia; 84 miles southwest of Washington, D.C.
At the time there were 10 earthquakes (including aftershocks) in Virginia from that Tuesday through Saturday. Only one of which was felt in the High Country on that Tuesday. The effects were felt as far north as Rhode Island and New York City. The largest quake since 1970 regionally occurred near the Virginia/North Carolina border on February 11, 1994 and measured 3.4. No other details about the event were available. 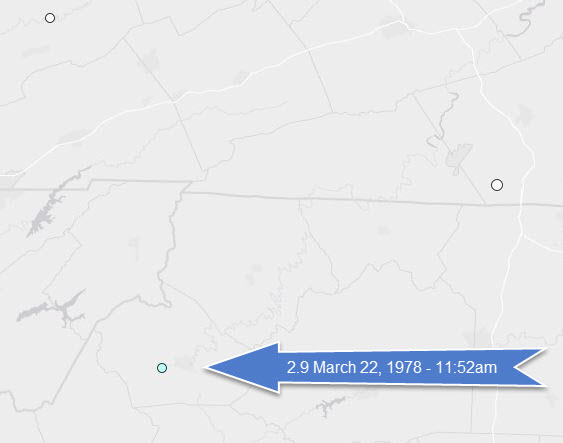 The second largest quake occurred February 16, 1988 in East Tennessee and measured 3.3. 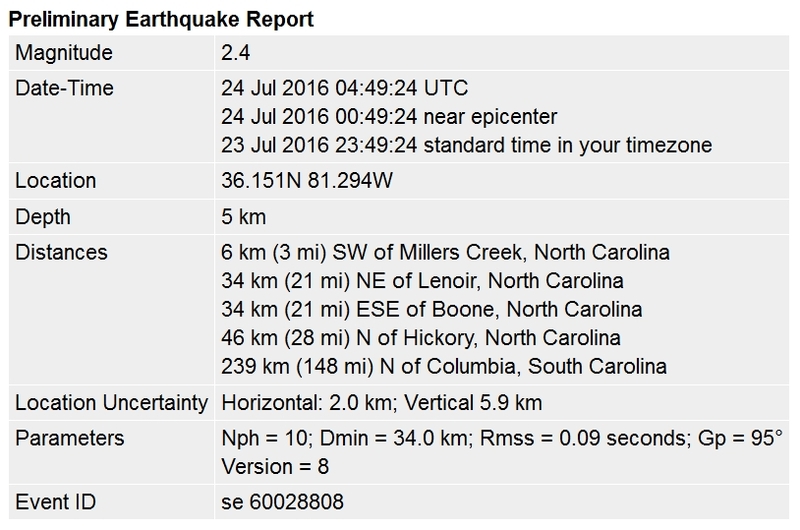 Wilkes County Earthquake – August 31, 1861. Magnitude 5.1. 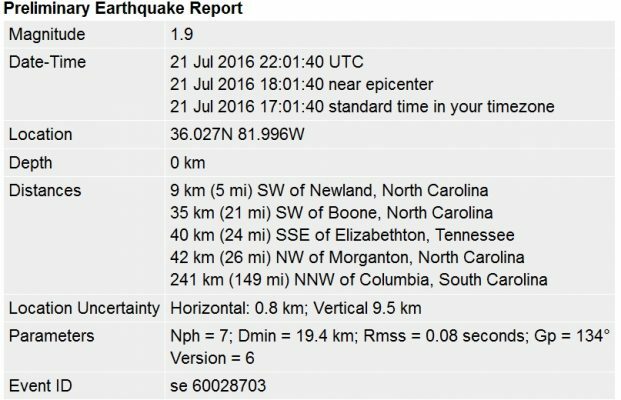 The epicenter of this earthquake was near Wilkesboro, where intense shaking caused bricks to fall from chimneys. The shock was felt from Washington, D.C., to Charleston, South Carolina, and Cincinnati, Ohio. 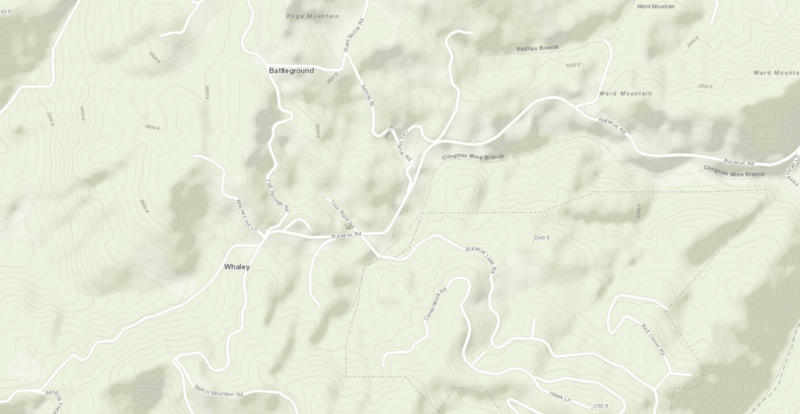 Skyland Earthquake – February 21, 1916. Magnitude 5.5. 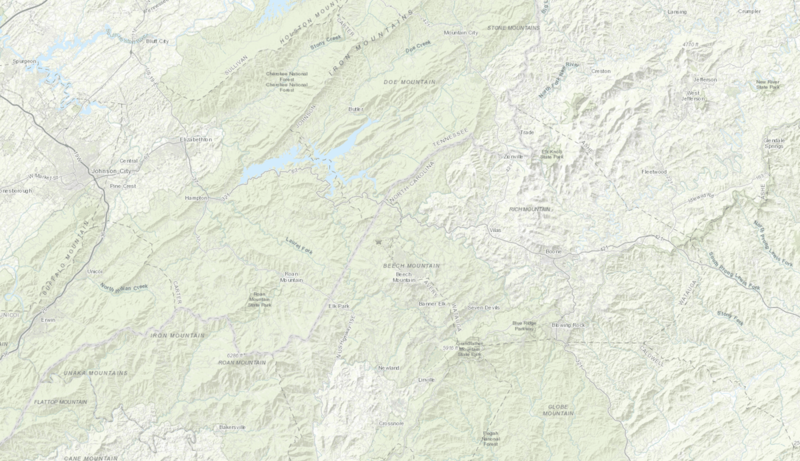 Damage occurred in Skyland, Waynesville, Tryon, and Forest City. Chimney tops were dislodged, and many windowpanes were broken. 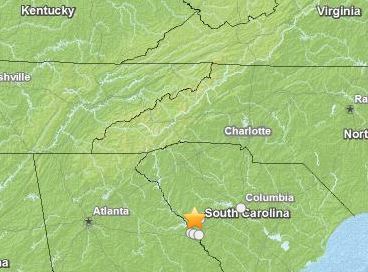 The quake was felt for over 200,000 square miles, including in the Carolinas, Alabama, Kentucky, and West Virginia. 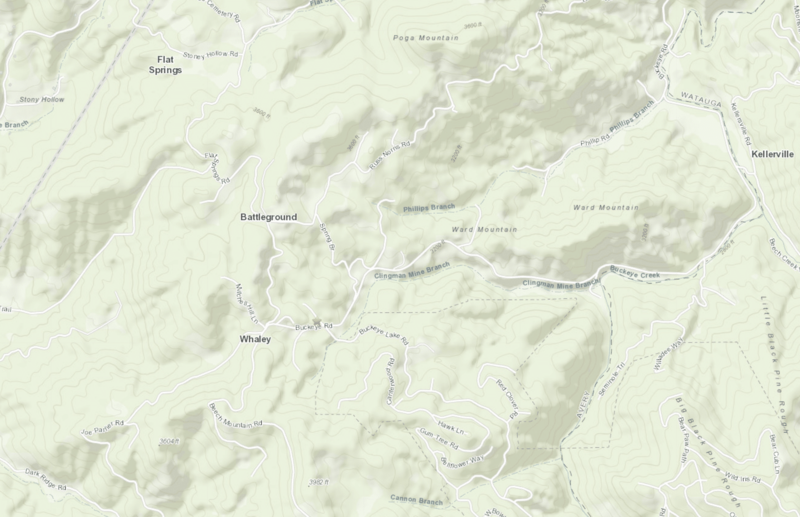 It is also known as the Waynesville earthquake, although the epicenter was closer to Skyland. 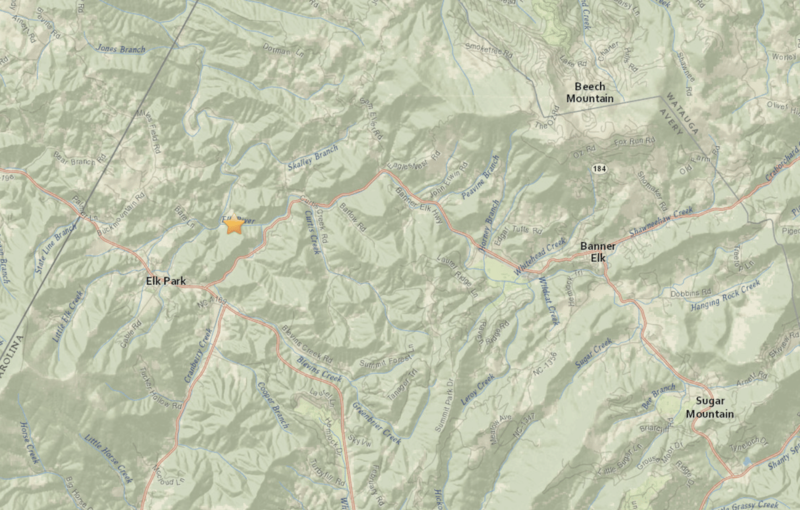 Mitchell County Earthquake – July 8, 1926. Magnitude 5.2. Centered in southern Mitchell County, this sharp local earthquake toppled one chimney and cracked several others. Other damage included cracked house foundations, dislodged foundations, broken water pipes, and fallen glassware from shelves. The area of significant damage was about 0.5 miles long and 900 feet wide, but it was felt over an area of about 40,000 square miles.